Because of their combination of affordability and looks that go with any style, stainless steel sinks continue to be very popular for kitchen remodeling projects. They’re available in the widest range of sizes, shapes, types and styles, so you’ll find many options that will go with the kitchen design you’re planning. This set of stainless steel kitchen sink guides will help you make an informed decision about this material and compare it to other materials we feature including copper, porcelain, composite granite and cast iron. 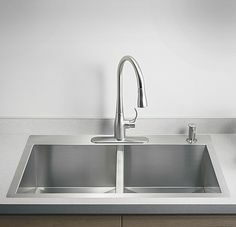 The Stainless Steel Kitchen Sink Buying Guide is a great place to start your research because stainless steel sink types, styles, prices and pros & cons are included. 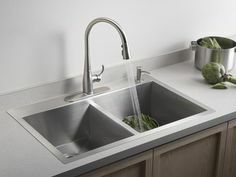 The Stainless Steel Sink Price Guide gives detailed pricing information for various types of sink including topmount, undermount and apron/farmhouse stainless steel kitchen sinks. The Stainless Steel Sink Maintenance & Care Guide provides tips for keeping your sink sparkling for many years. Cleaning dos and don’ts are included. View all of our colorful Pinterest pages for ideas for your kitchen project! 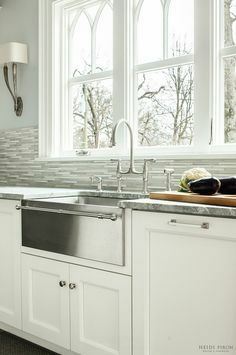 The stainless steel sinks Pinterest page is full of information that will help you plan a kitchen you’ll really love. Whether you’re just replacing the sink or want an entire kitchen makeover, we can help you find a qualified contractor for the work. When you choose the Free Estimates tab and fill out a quick form, you’ll receive written estimates from three of the top kitchen installers in your area. This is the no-hassle way to get competitive estimates for the work you want done.